The last couple of weeks, Vom Fass Claremont has been hosting a battle for the Inland Empire’s best bartender, and round one voting wraps up in just a couple of days. The top three finalists in round one will face off in the Industry Day Cocktail Mix Off at Vom Fass, where they will create cocktails using one of three Teeling Whiskeys available at Vom Fass. Judges will include local business owners, other bartenders and Jack Teeling (of Teeling Whiskey). Coffee’s not the only thing you can get for free tomorrow (September 29). Stop by BJ’s Restaurant and Brewhouse, spend $9.95 or more, and get a free regular-sized chocolate chunk Pizookie! Inland Empire BJ’s locations include San Bernardino, Rancho Cucamonga, Chino Hills, Corona, Moreno Valley, Menifee and Temecula. Tomorrow (September 29) is National Coffee Day and several chains are offering freebies and deals in honor of the occasion. Krispy Kreme Doughnuts is giving guests a free Original Glazed doughnut and a free 12-ounce cup of coffee at participating locations. The Inland Empire’s sole Krispy Kreme is at 4485 Mills Circle in Ontario. For more information, click here. Dunkin’ Donuts is giving guests a free medium hot or iced Dark Roast coffee tomorrow. Inland Empire locations include Upland (355 S. Mountain Ave.) and Barstow (1611 E. Main St.). Click here for more information. Veterans of Foreign Wars Post 8680’s Car/Motorcycle Show and Chili Cook-off is going on until 4 p.m. today (September 27) at the post, 8751 Industrial Lane, Rancho Cucamonga. Yours truly is one of the “local celebrities” that will be judging the chili cook-off. The judging is set to begin around 2 p.m. Please feel free to come down and help support a worthy cause. After losing most of our fresh & easy stores here in the Inland Empire, we’re glad to see another couple of discount grocery stores expanding into the area. Both Aldi, which is related to Trader Joe’s, and Grocery Outlet have announced plans to expand into Southern California. But will there be a store near you? We’ve got a list of forthcoming locations here in the Inland Empire. Take a peek over the jump to see if one will land in your neighborhood. 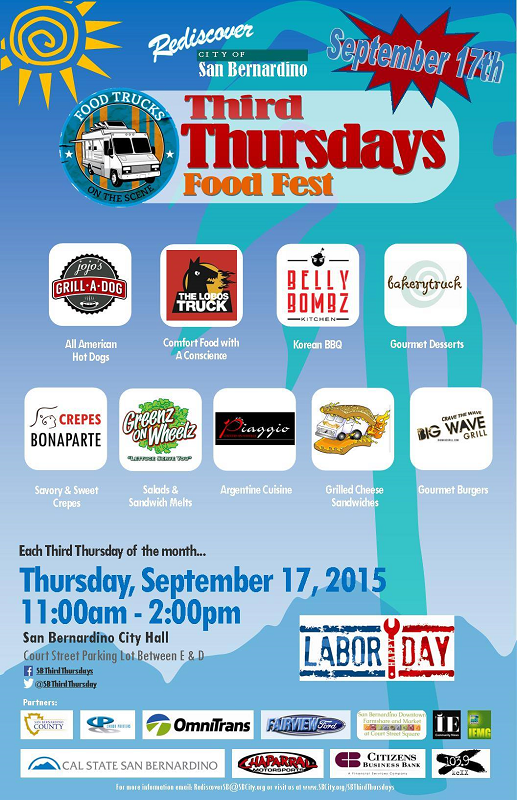 Today (September 17) is the third Thursday of the month, and that means that food trucks will be converging on San Bernardino’s City Hall. The trucks will park in the parking lot on the south side of Court Street between D and E streets from 11 a.m. to 2 p.m. Scheduled trucks include the Bakery Truck, Belly Bombz, Big Wave Grill, Crepes Bonaparte, Greenz on Wheelz, the Grilled Cheese Truck, Jojo’s Grill-A-Dog, the Lobos Truck and Piaggio on Wheels. For updates, “Like” the event on Facebook. Are you an Olive Garden fanatic? If you are, then you probably already know what this post is about, but just in case you don’t, read on. 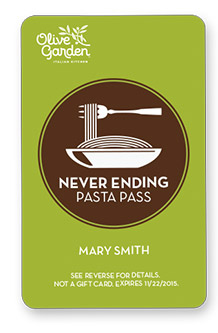 The divisive Italian chain is bringing back its frenzy-inducing Never Ending Pasta Pass. With it, guests can enjoy the chain’s Never Ending Pasta Bowl as many times as they like for seven weeks — October 5 through November 22. Let’s do the math: Lunch and dinner every day for seven weeks is 49 days, times two meals…that’s 98 meals if you went for lunch and dinner every day of the promotion! Longtime reader Carl tipped us off Monday night that the Victoria Gardens Toby Keith’s I ♥ This Bar & Grill has closed. It’s just the latest of a string of closures for the chain, but whatever happened, happened pretty quickly: Yelp reviews indicate the restaurant was open Sunday night and the restaurant’s Twitter page posted a link early Monday morning to its now-nonexistent Facebook page. A Love and Theft concert slated to take place at the venue on September 24 has been cancelled. Several of the chain’s locations across the country have closed in the last year or so, including a Phoenix restaurant that opened earlier this year. In August, workers in Cincinnati sued the chain for non-payment of wages and concealing the restaurant’s shutdown in July of this year. That location also had several legal issues. Other recently shuttered locations include Oxnard, Folsom, Syracuse, N.Y., Newport News, Va., Tucson, Ariz., Orlando, Fla., Woodbridge, Va., Orange Beach, Ala., St. Louis Park, Minn., and Houston. A Rosemont, Ill. location is facing an eviction trial in October. 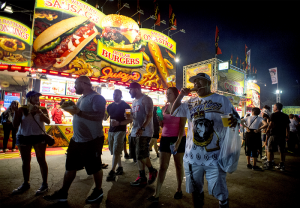 The restaurants are operated by Phoenix-based Boomtown Entertainment. I ♥ This Bar & Grill? Well…maybe not so much. The Rancho Cucamonga location, which opened in April 2012, was at 12635 North Main St. 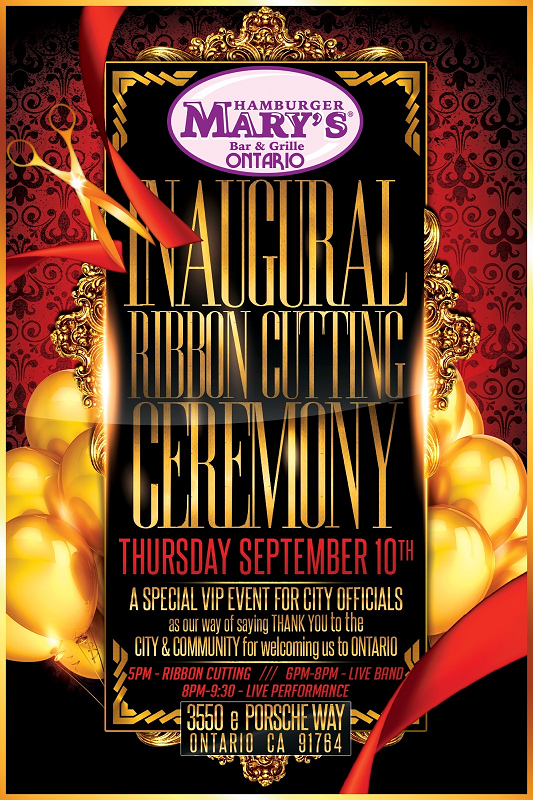 The newly-opened Hamburger Mary’s in Ontario will kick off its grand opening celebration with a ribbon-cutting ceremony today (September 10). 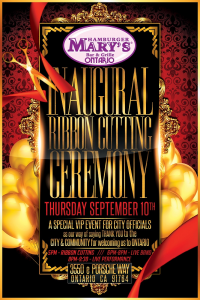 The ribbon-cutting begins at 5 p.m., with a live band performing from 6 to 8 p.m.
A special drag show — featuring Chad Michaels and Delta Work from RuPaul’s Drag Race, along with Mayhem Miller and Dolly Levi — begins at 8 p.m. The grand opening celebration continues at 5 p.m. Saturday (September 12). Hamburger Mary’s is at 3550 E. Porsche Way. For updates, “Like” the restaurant’s Facebook page. 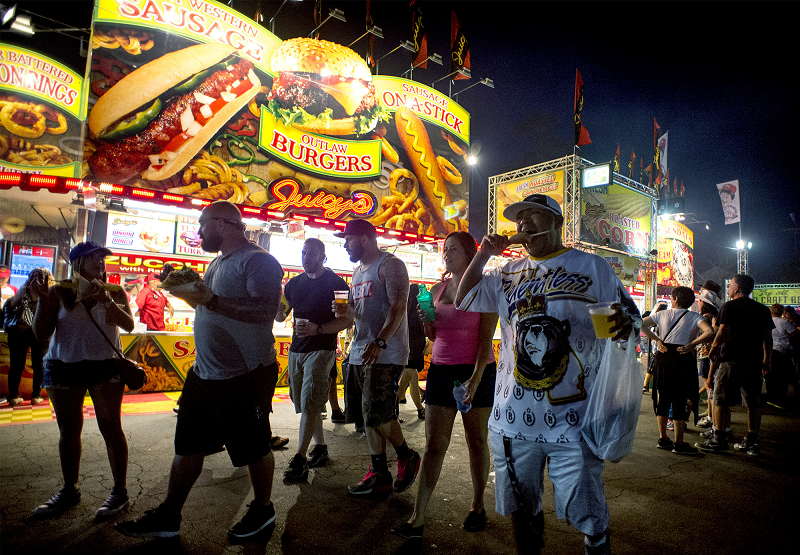 Want to visit the Los Angeles County Fair and get a ride wristband for just $25? Simply head to any participating Subway restaurant. You gotta be willing to play hooky on Thursdays, because that’s the only day the offer is good. Still, it’s a tremendous deal, considering the wristband alone is normally $50 by itself. 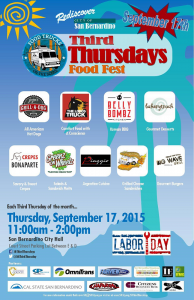 Click here for a list of participating locations, which includes most Inland Empire restaurants.